Early in 2013, a library sciences researcher at the University of Illinois proved what many of us already thought: Fredric Wertham, the child psychologist behind the anti-comics screed Seduction of the Innocent, fabricated much of his evidence against comics. The discovery brings to light how fallacious pseudoscience is often used by censors to attack comics, books, and other popular media like video games. Because Seduction lacks citations and a bibliography (just one indication that Wertham’s research was questionable), it was difficult to verify Wertham’s data or duplicate his investigations (yet another indication that his methods were questionable by scientific standards). Tilley went to the source: Wertham’s personal papers, which were made available by the Library of Congress in 2010. Tilley didn’t set out to disprove Seduction, but she soon found that many of the quotes that made it to the print edition of Seduction did not match the information in Wertham’s notes. 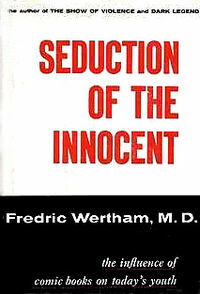 With the publication of Seduction of the Innocent in 1954, Fredric Wertham became single-handedly responsible for decades of self-censorship by the comics industry. The National Education Association named it their book of the year, and it led to the infamous 1954 hearings by the Senate Subcommittee on Juvenile Delinquency. Wertham was the star witness against comics, giving “expert” testimony on how comics fostered violent crime among juvenile readers. In response, the comics industry implemented the Comics Code Authority. The Authority’s strict, self-imposed rules on everything from drug use to criminal retribution to respect for authority all but destroyed the horror, crime, and adventure comic genres. Superhero comics managed to hold on but only with major changes to content and story lines that dispelled Wertham’s allegations of homosexuality, sadomasochism, and more. • How Much Did Things Change After the Enactment of the Comics Code of 1954? The Comics Code Authority is now defunct, but CBLDF still has to battle the antiquated ideas proposed by Wertham each time we defend a comic book from a challenge. Many people still feel comics are a low-value speech and comics are uniquely vulnerable to attack because of their visual nature. We’ve also worked to dispel the use of pseudoscience when other popular media are attacked: CBLDF’s amicus brief opposing a California law that would have regulated video games was cited by the Supreme Court in Brown v. EMA. 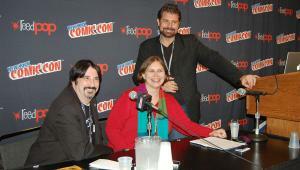 CBLDF argued that the contemporary attacks on video games mirrored the mid-century attacks on comics. The Supreme Court rightly struck down the California law, deciding that video games deserved First Amendment protection as much as any other creative medium. We continue to work against legislation that would attack video games based on questionable research because the attacks on video games could be easily extended to other media, including comics. While the revelation that Wertham fabricated much of his evidence against comics was not surprising to many in the comics industry, the stigma against comics continues to exist. Tilley’s invaluable research will help dissuade many from the idea that comics are low-value speech, but CBLDF still has a long road ahead when it comes to battling the censorship of the medium.